Mandy has the doctors' blessings to keep playing; she's learning how to protect her back and mitigate her pain. And so we're launching ourselves, without the usual time to plan, into our summer adventures. Our friend Britt had planned to go with her on a two-week train-and-bike trip to northern New York, but they decided they weren't up to the back-to-back 70-mile days that it would require. They've put their heads together and decided to go on a two-week rambling road trip to the Badlands, Corn Palace, Mount Rushmore, Glacier, and Arches. She's gone to Tulsa for her three-week visit, leaving the rest of us to plan their trip. 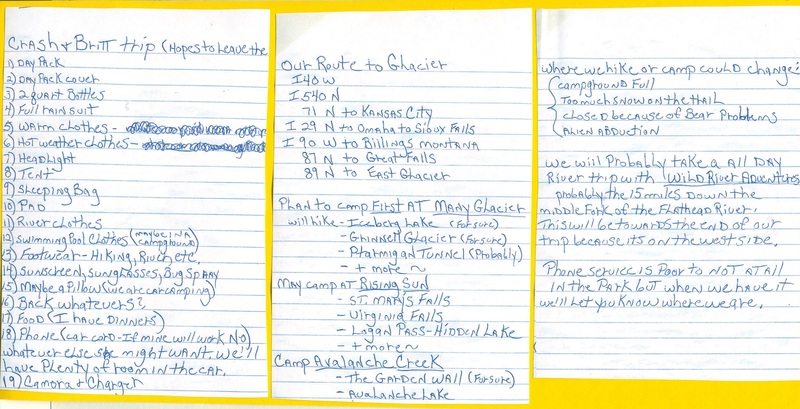 Britt's planning the route and the side trips and the car campgrounds and the dayhikes they'll do. Earlier this week, Britt tucked three pages of notes under my windshield wiper in the office parking lot. Mandy has most of what she needs for camping and rafting and hiking adventures, so Bryan and I are busying ourselves with little details we love to plan. I've bought her a big spiral-bound US atlas. I've ordered some gaiters and a pair of rain pants to replace the ones she somehow managed to lose. I'm working on building her a decent first aid kit, heavy on Band-Aids and vet wrap. And then there are the boots. Mandy's feet seem to have stopped growing (at size eleven!!!) so we'd planned to get her a new pair of 'grownup' hiking boots this year. But now her needs are a little different than they once were. In addition to shopping for Gortex boots with stiff soles and good reviews, we have to find boots with an outsole that can be separated to add an 18mm lift. Finally, we found a couple of good options, and they're sitting in boxes in the living room waiting for her to come home to try them on. 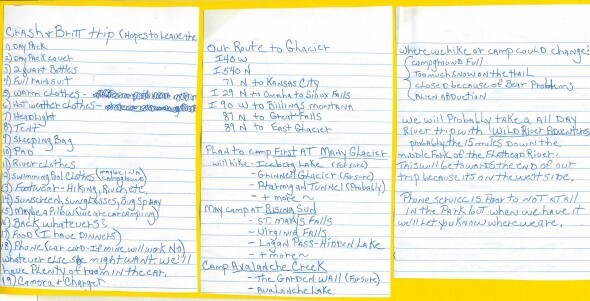 Britt's planning a rambling trip to Glacier that will end up in southern Colorado. Bryan and I will have a kid-free road trip to Great Sand Dunes, where we'll meet up with our adventurers. 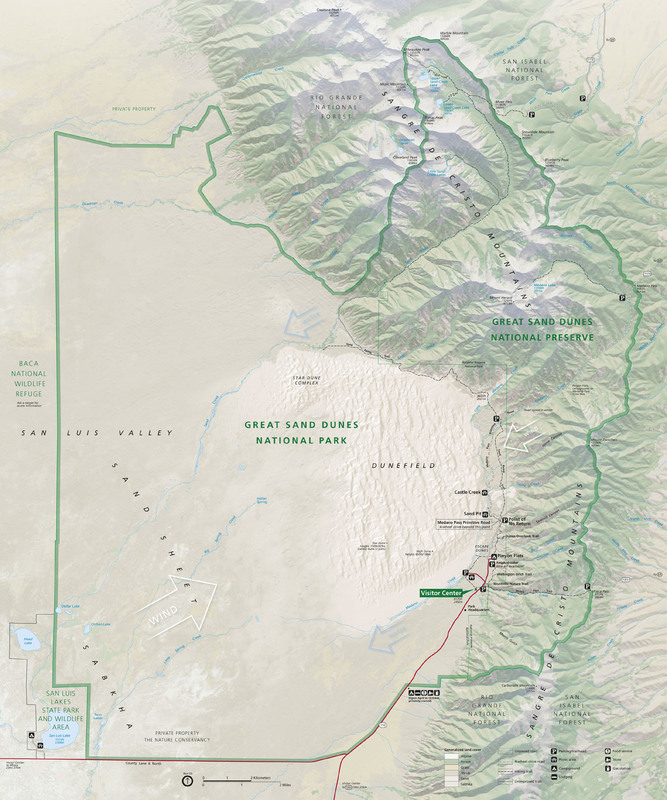 Bryan's heading up the effort to read guidebooks and plan the hikes we'll do there - the sand dune surfing, the overnight in the dunefield, the hikes in the Sangre de Cristos, the fourteener summits we'll try. We'd like to spend our midweek 'day off' in Salida, doing laundry and eating big cheeseburgers and finding a place to take a shower. I do love to plan a trip.